What Day Of The Week Is August 1? 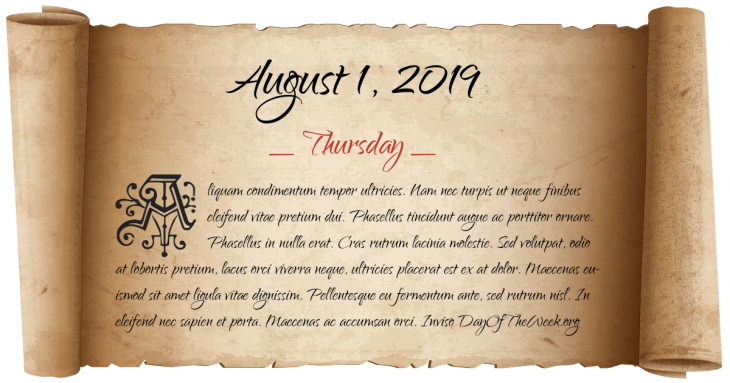 August 1, 2019 is the 213rd day of the year 2019 in the Gregorian calendar. There are 152 days remaining until the end of the year. The day of the week is Thursday. Non-labourer slaves in most of the British Empire are emancipated. The Lombard Street Riot erupts in Philadelphia, Pennsylvania, US. The Nanchang Uprising marks the first significant battle in the Chinese Civil War between the Kuomintang and Communist Party of China. This day is commemorated as the anniversary of the founding of the People’s Liberation Army. The Warsaw Uprising against the Nazi occupation breaks out in Warsaw, Poland. The United States and Canada form the North American Air Defense Command (NORAD). Who were born on August 1?